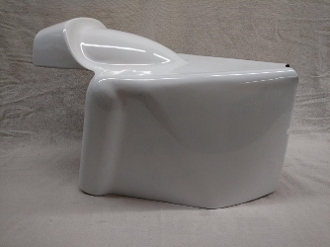 Our GRFTSA is an exact replica of the seat used on Gene Romero's flattrack machines. Recently we had the good fortune to locate and borrow the original hand formed aluminum pattern used to fabricate the original fiberglass mold. In 1970 the pattern, mold, and a small batch of less than a dozen seats were made for Gene's bikes and as spares. The seats were never offered for sale to the public and the over time the original mold was lost. We recently completed a new mold from the original pattern, and seats are now available.